Instructions: My card is 4 1/4 x 5 1/2". Make card base and add a piece of blue cardstock cut 1/8" smaller. Next cut a piece of the paper collection and cut it 1/8" smaller and glue it down as well. Set this aside while we work on the elements for the card. Using Danube Blue Memento Ink stamp the pocket onto a piece of blue cardstock and another one onto a piece of the paper collection. Cut out both with the coordinating die. I cut off the top part of the paper collection pocket and glued it to the blue cardstock pocket. Stamp flower petals onto white cardstock using Cantaloupe, Majestic Violet and Danube Blue inks and cut out using the coordinating dies. Color the buttons with Majestic Violet and glue one to the pocket. Shape the flower petals and add Prills to the centers and set aside to dry. Using Olive Green Stazon Ink, stamp the leaves and color using Bamboo Leaves ink. Load them into the mold and run through the Sizzix Vagabond machine. Set the leaves aside to dry. Using Majestic Violet ink, stamp the sentiment onto a stamped arrow on a piece of the paper collection and use coordinating die to cut out. Add dimensional tape to the back and adhere it to the pocket. 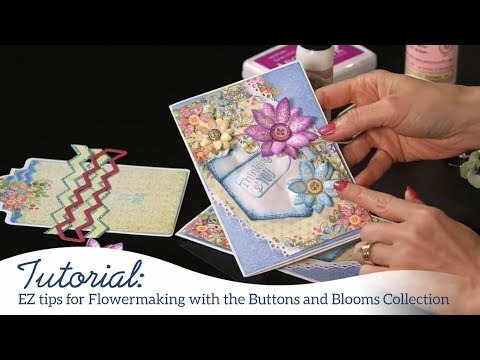 Add dimensional tape to the pocket and adhere it to the card front. Decide on placement for the flowers and leaves and glue them into place.